I just noticed that the back part of my phone(around the camera lens), the cover is peeling off...so, the most outer layer of the body is gone and I can see the inner part of the body which is not shiny...how to stop the outer layer from peeling off??? Can you take a picture of it? Do you use a Wireless Charger ? I had the same problem on my red 920, i used a wireless charger on my phone. Read somewhere use a cloth or some tissues then place the phone on the wireless charger. 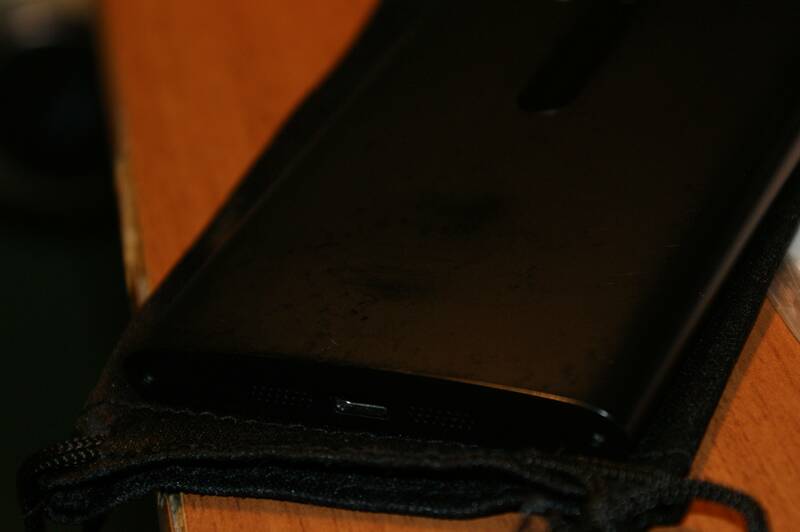 I have a black 920 and it looks like it's dirty on the back, but it's not. I tried several times to clean it, with alcohol too and it doesn't go away. The first time I noticed this was when I pulled off the original Nokia cover. Weird. how can this be possible ? Do you have the same problem as me, I thought I am the only one. It is funny supposing the cover is made to protect the phone, not to damage it, lol. I had my L920 in a yellow casing for several months and now about two months in a red housing. I am always using a Nokia charger at night. I have not observed this on either the yellow or the red (yet). Note, I am not referring to a protection case but the actual housing of the phone. I would think these are isolated cases of a housing with a defect and I'd agree to contact Nokia about it. It looks like a problem with the polycarbonate not having been tempered (annealed) correctly and it caused a skin layer with different pre-stress (probably cooled too fast when it came out of the mold). Heat will cause this outer layer to crack off the main housing body over time. This will first happen at the weakest points with most stress, which is at curved openings. Note that the camera cover is actually sitting on a layer of PC, so there is a sharp step where the camera cover is laid down.I would exactly argue this with Nokia Care. PS; I am not sure what you mean by the cover "damaging the phone". It is still the cover that is damaged, not the phone....Yes, I agree this shouldn't happen. Last edited by Derausgewanderte; 12-25-2013 at 05:31 PM. I had my L920 in a yellow casing for several months and now about two months in a red casing. I am always using a Nokia charger at night. I have not observed this on either the yellow or the red (yet). The photo is not very good, but this is all I could get now. P.S; I meant that I had Nokia CC-1043 on, and when I pulled it off I saw this. I can't tell if that's a peel or chipping from being dropped. That's clearly peel, where it was dropped you can see dents, but not on those photos. And most of this peel was made when I had the original nokia cover on. 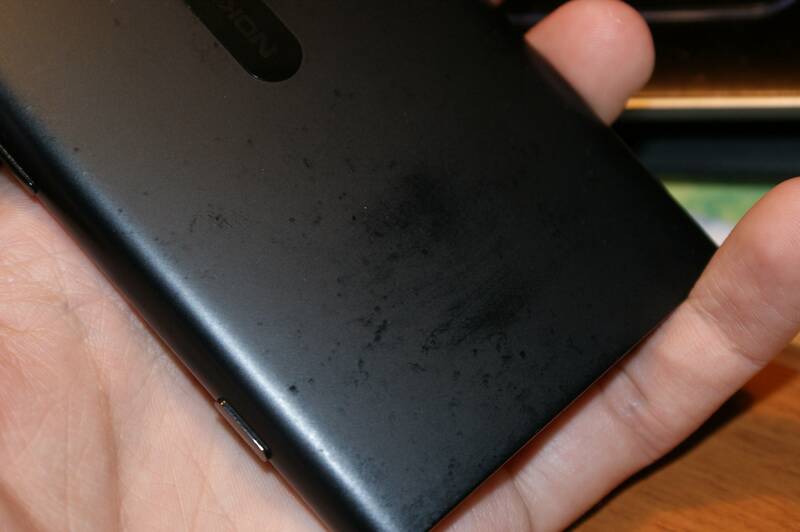 these are stains from the Nokia protection case right? (at least from what I see on your images it looks like the PC matte is smudged from the protection case, which has been observed on glossy phones as well, just the other way around). I clarified my post above, in which I was referring to the housing of the phone itself, not a protection case. Yes the OP thing was without a cover, mine with the official one. That thread is right about my problem. 1st ques: will polycarbonate unibody gets damaged if a cover is installed??? 2nd ques: lets say customer care said that it was not their fault, how can i change the housing?? ?where can i go n change n how much would it cost??? I'm afraid that every Nokia phone that I ever owned suffered from the same problem. It's one of the reasons I wouldn't buy a Nokia again. You could try contacting your local authority that deals with false advertising, over the use of the term 'unibody' in Nokia's advertising. Ahhh, ok. When I saw these pics, I pulled the cover off my L920 to inspect it. So far, no peeling. I wonder if the materials and or bonding agents used are different on phones with color other than black and white models. I've seen posts like this for yellow, cyan phones too. You know as I think about it, let me ask, who made the cover you used to protect your device? I wonder if that has some bearing on deterioration. 1) apparently that happens to some folks that use the Nokia case (CC-1043). E.g. the glossy surface gets stained and looks matte in random spots and makes the body looks "unpleasant" . I can tell you that this did not happen to my wife's white L920 with an Incipio Dual Pro. The phone looks like brand new after a year in the case. From what I gathered so far the damage occurs only with Nokia's own CC-1043 cover. It is very possible that the recipe they used leaves small amounts of softener that react with the PC. 2) there are two main threads on WPC, one here: there are links in this thread with videos how to change it. After reading all the posts you will however find that not everybody is happy with what they get on ebay. Some of the housings apparently have defects. Most of the people were able to get a refund or exchange. I purchased two so far (red and yellow) from two different ebay sellers and I am satisfied with the outcome. Last edited by Derausgewanderte; 12-26-2013 at 10:55 AM. It's got to be a manufacturing defect and as such I'd get Nokia to replace the shell. 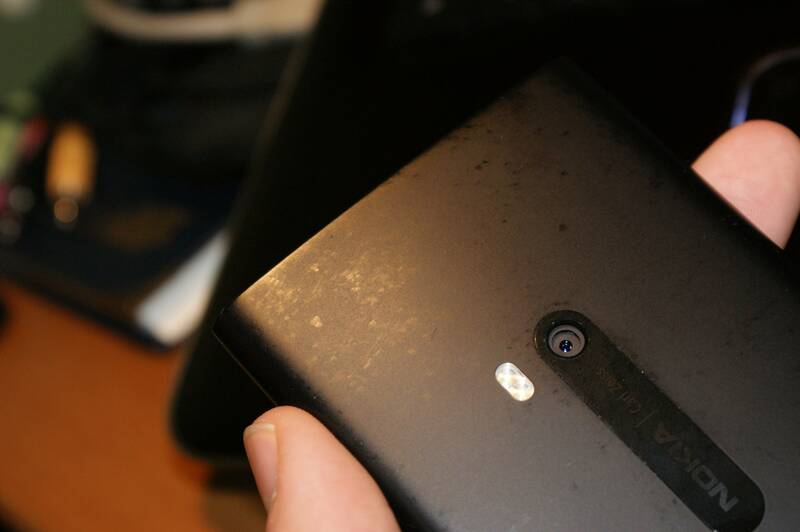 I've had my Lumia 920 for over a year now, yellow, and there's no evidence the clearcoat peeling anywhere. The back is scratched up, as you'd expect from a year's worth of use, and it's got a dent in one corner but nothing is peeling anyway anywhere. This does make for a good case for gloss over matte finishes as those tend to rub away and typically do so unevenly. I should point out that I've never used a case with this phone. I find that most cases tend to cause premature wear because dust gets in between the phone and the case. I keep a cover on mine and on the back, you cannot tell the difference between it and a new L920 and its over a year old. I have this scratch on the face I can't begin to explain how it got there. lol. But if I clean the oily hand prints, that is all you'll notice. How bad is this DPI scaling when using Photoshop CS5 on a SP2? Prevent accidental camera launch when phone is locked?? ?